On March 26, 2010, one thousand Scientologists, university students and community and government leaders gathered to celebrate the opening of the new Scientology Life Improvement Centre in Johannesburg, South Africa. Following the ribbon cutting, attendees toured the Life Improvement Centre’s interactive displays presenting Dianetics and Scientology principles and their application to life. The Centre is an outreach facility of the Church of Scientology of Johannesburg, and provides practical courses addressing a variety of life situations, including study difficulties, problems with relationships, and personal and work-related stress. 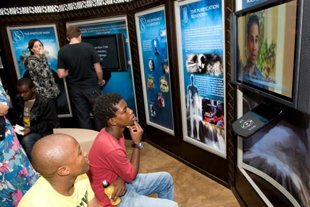 Those visiting the new Scientology Life Improvement Centre take self-guided tours of multimedia displays illustrating the beliefs and practices of Scientology, the life and legacy of Founder L. Ron Hubbard, and the Church’s global humanitarian and social betterment programs. Those touring the Life Improvement Centre learn about the spoken and written works of Scientology Founder L. Ron Hubbard. Totaling more than 10,000 writings and 3,000 recorded lectures, they comprise the single most embracive statement on the mind, spirit and life—and form the basis of all courses and services provided to the community by the new Centre in Johannesburg’s Braamfontein district. Traditional African music marked the opening of a new Scientology Life Improvement Centre on March 26, 2010, as one thousand university students, community and government leaders, artists and local Scientologists crowded Station Street in Johannesburg for the dedication. 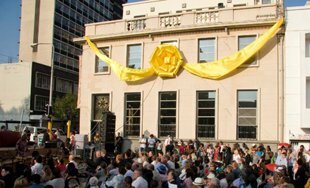 Civic and government leaders addressed the crowd of one thousand, welcoming the new Scientology Life Improvement Centre to the Braamfontein district of Johannesburg. The Centre is located near the University of Witswatersrand (WITS) in the Braamfontein district of the city, and so serves a richly diverse community whose common goal is expressed in the district’s motto: “The place where people rise to greatness.” As master of ceremonies, the Centre’s director, Edmund Dladlu, pledged to work with the community to make this motto a reality. Following the ribbon cutting , attendees toured the Life Improvement Centre’s interactive displays presenting Dianetics and Scientology principles and their application to life. The Centre is an outreach facility of the Church of Scientology of Johannesburg, and provides practical courses addressing a variety of life situations, including study difficulties, problems with relationships, and personal and work-related stress. The ceremony concluded with the traditional cutting of the ribbon, signifying the official opening of the Centre. 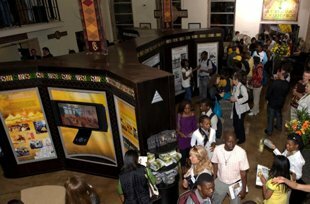 Hundreds poured in to tour the Public Information Center, viewing films and multimedia presentations describing Scientology beliefs and practices, the life and accomplishments of L. Ron Hubbard, and the social betterment and community outreach programs of the Church, both in Africa and throughout the world.